In the lead up to the 2015 federal election we have decided to take a critical look at the different styles of campaigns that will come to the forefront in the coming weeks. The character of a campaign can change based on a number of variables, with no two campaigns ever being exactly the same. In our first installment, let’s look at campaigns run on issues. Issues Campaigns are dominated by debate over a key set of problems or proposals. An issue, either by design or by happenstance, becomes the deciding factor at the ballot over the course of the campaign. All major parties will outline their response to the issue and allow the voters to decide which course of action is the most desirable. Issues Campaigns provide the opportunity for parties to not only solidify support from within their own base, but also win votes from their opponent’s bases, if they are able to take the most popular stance on a particular issue. The key to running a successful issues campaign is to be the first horse out of the gate. If your party is able to successfully frame an issue in such a way that forces the opposing parties to take differing – and less popular – stances, then you stand a better chance at gaining support at your opponent’s expense. Issues campaigns also contain an inherent element of risk. By establishing your position first, you might find yourself on the wrong side of a debate, which leaves you with two unappetizing options: backtrack, or cling to the sinking ship. Below we’ll look at two examples of issues campaigns: one successful, and one unsuccessful. A great example of a successful issues campaign was the 2007 Ontario provincial election which pitted incumbent Liberal Premier Dalton McGuinty against Progressive Conservative Leader John Tory in a battle over whether to extend funding to faith-based schools. Early in the campaign, the Liberals jumped on what seemed to be a small piece of John Tory’s election platform: his promise to extend public funding to other faith-based schools. Internal Liberal polling showed this issue to be extremely unpopular with Ontarians, and the McGuinty Liberals were able to sufficiently galvanize both their base and the media to focus on the issue almost exclusively. It is important to note that campaign promises like Tory’s funding extension for faith based schools are not, in isolation, enough to transform a campaign into an issues campaign. A campaign promise can become an issues campaign when one or more parties focus the bulk of their energy on promoting – or in this case, arguing against – the promise. In this example, although faith-based school funding was part of the PC campaign, the Liberal party was the first party to focus their energy on the issue, thus giving them a head start in the debate. Over the course of the campaign, the Liberals continued to hammer away at Tory’s position until even his own caucus members turned on him. Eventually, Tory reversed his stance on the issue, promising to call for a free vote if he won the election. 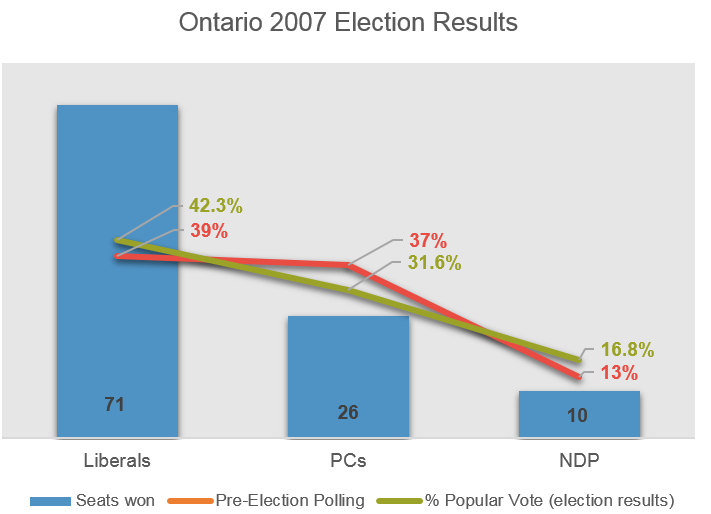 The Liberals ended up winning the election with a majority government and 42.3% of the popular vote. Tory was defeated in his riding and the PCs were left scrambling to find a new leader as McGuinty slid into his second majority mandate in the province. In the lead up to B.C.’s 2013 election, the incumbent Liberals polled several points below the NDP in every public opinion poll. Even up until the night of the election most pollsters were predicting an NDP win of some variety or another. 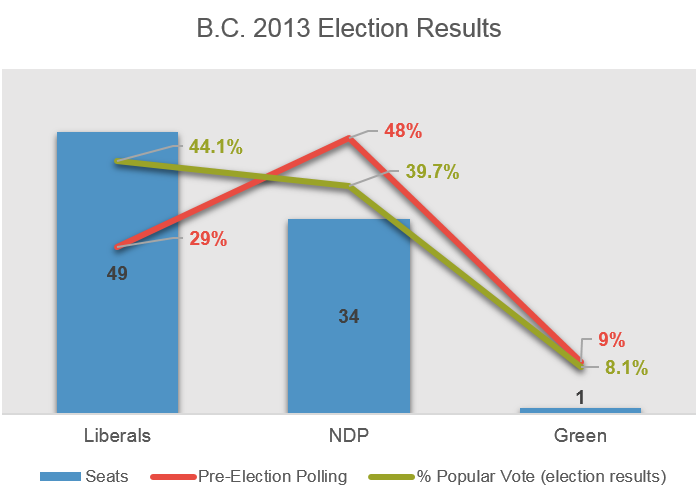 However, as the results poured in, the B.C. Liberals ended up with a surprise majority government. Although there remains considerable debate over the accuracy of the polling numbers and the reasons for the Liberal majority win, the argument can be made that turning point in this campaign came a few weeks before Election Day when NDP leader Adrian Dix decided to take a strong stance on the Kinder Morgan TransMountain pipeline. In an effort to capitalize on B.C.’s environmental vote, NDP leader Dix announced that his party would not support the TransMountain pipeline, which would carry Alberta crude to the lower mainland port at Burnaby, B.C. Both the Green Party and the Liberals accused the NDP of backtracking – Dix stated earlier in the campaign that his party would await the outcome of the federal review before passing judgement on the project. Whether the majority British Columbians support the Kinder Morgan pipeline, or merely disliked the change in the NDP’s position, is difficult to say. However, the NDP found themselves on the wrong side of an issues campaign they themselves framed, and ended up losing an election that they – if polling numbers are to believed – should have won easily. The first, and most obvious way to use an issues campaign to your advantage is to frame your issue as one that will have some level of political sway. To do this successfully you typically require substantial polling to back up your case when you present it to a political party. Alternatively, you can lean on a leader’s ideology or pressure points (if the issue affects his or her riding, or a key demographic, for example) in order to convince a party to take up your cause. If you have neither the time nor the access to speak to party officials in person, a substantial grassroots social media campaign can be enough to sway the hearts and minds of both voters and party officials alike. Your issue need not be the defining issue of a campaign in order to have an impact on the outcome. By convincing a party to take up your cause – even as just a one off promise in their campaign platform – you could see your issue gain substantial traction. The strength of the media should not be underestimated in an issues campaign. A campaign becomes an issues campaign if, and only if, the media latches onto the issue and continues to bring it up when reporting on the election. There are risks associated with bringing your issue forward during a campaign. There is always the possibility that one – or multiple – parties will side against you. If those parties win the election, you may have to wait until they are voted out of office before you can make any more progress. Another risk could be if public support for your issue drops off as the issue is exposed to election debate, thus forcing the party into the difficult issue on positioning, that they would most likely want to avoid from the outset.